Spent a delightful and as always an educational day yesterday accompanying some of our Sales people to a couple San Francisco restaurants. I always look forward to these trips, because they are sheer adventure. You never know what you’re going to get. We went first to a small eastern Mediterranean place in the Mission District, Tawla, which has been getting huge press lately. It’s on Valencia at Duboce, a neighborhood that’s been undergoing a lot of pressure lately due to gentrification. But you know what? I was hanging out there 35 years ago, and it hasn’t changed that much! Still gritty, with (let us say) an interesting local street population. The somm was a guy who’s worked at a lot of Michelin restaurants but, he explained, wanted something smaller, where he could have a more creative, curated wine list. Then it was on to Perbacco, a great place I’ve always enjoyed. We had lunch there (amazing pasta) with the somm from Flatiron, the new wine shop in the Palace Hotel. Then onto Scoma’s. 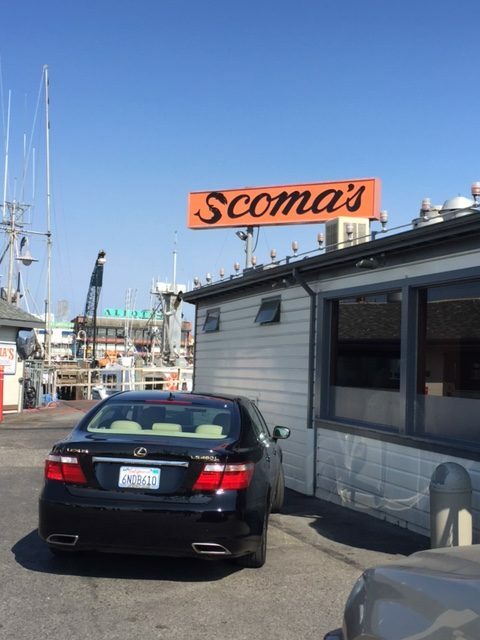 Now, if you don’t know Scoma’s, it’s one of the mainstays of Fisherman’s Wharf. As I told the wine guy, who’s been there for 20 years, he’s probably served several generations of my family over the decades. Each of these places and people was totally different. But each is part of the mosaic that makes up San Francisco. Although I’ve lived in Oakland for close to 30 years, I lived in San Francisco for a decade prior to that, and I still love going there. It’s only 3 subway stops away from my place, so it’s easy; driving and parking in S.F. is a total nightmare. Everybody gripes about housing prices in the City, but when I moved there, in 1979, everybody was griping then about the same thing! As I suppose they were in the 1940s. So the more things change… I think San Francisco is fundamentally unalterable, and I mean that in a good way. You can bend it, stretch it, but you can’t break it. It’s the old Barbary Coast: a little bit nice, a little bit naughty, and heart-achingly beautiful. You know, some people have asked me if it’s not odd for me to have gone from being a wine critic to working for a wine company. My answer is always the same: not at all. I’ve always been a bit of an iconoclast (if that’s not already obvious) and I still am. I didn’t fit into a neat, tidy little package as a wine critic, and I don’t fit into a neat, tidy package working for Jackson Family Wines. The most important thing to me, in the intellectual sense, is honesty. I don’t lie well, I don’t spin well, it’s hard for me to hide my feelings (as my Facebook friends and Twitter followers no doubt are aware). When I meet people at restaurants and wine stores on these sales trips, I act exactly the same as I would at a cocktail party: put on a smile, try to engage, find things in common to talk about. If the people want to talk about the wines, I’m down with that, and the Jackson sales people I’m with often know more about the technical details than I do; together, we can answer any question (almost). But from these trips I’ve learned something I really didn’t understand when I was a wine critic, and that’s the value of relationships. Wine critics don’t need to establish relationships in the industry. They can, of course (and we all do), but the essence of being a wine critic is that you’re a loner. I was a bit of a loner as a critic. You have to be; you have to keep your emotional distance from people whose wines you might have to trash. In sales, it’s different, and I truly enjoy making these connections. People are fabulous treasure troves to dig through, to discover who they are, where they’re coming from, what makes them smile. Which makes me look forward to next week, when I’ll be in Texas, from which I hope to be able to blog every day. Last week, while Americans were watching developments concerning the Comcast-Time Warner Cable merger, which eventually (and thankfully) collapsed, another more successful merger went almost unnoticed. That was the marriage between Blue Bottle Coffee and Tartine Bakery, a far happier union that consumers could celebrate, instead of worrying about. Blue Bottle was founded in my hometown of Oakland and now has cafés throughout the Bay Area, L.A., New York City and Japan. It’s become what Starbucks used to be: the hippest java joint around, one of “the high-end coffee industry’s most respected roasters,” according to Fast Company, an appraisal shared by Bloomberg Business, which described Blue Bottle as “the next wave of artisanal coffee shops” and reported on enthusiastic investments in the company by Silicon Valley tech giants such as Google, WordPress and Twitter. There are lessons for the wine industry, particularly for family-owned wineries that want a more personal connection with consumers. Consumers do want “planet-friendly” things to buy. They do want quality that’s apparent, and preferably locally-sourced. But, maybe more than anything, they want a connection with the people who sell them products and services. Never in the history of American industry has that personal connection been more important. People—in their loneliness, idealism and confusion—desire to feel something human. Not the appearance of something human. Not something crafted in some P.R. shop that seems human. Something that is human. What a concept! So doable, and yet so rarely done. This is precisely the challenge wineries must confront, and solve, in the coming years, if they are to remain viable, in the face not only of domestic competition but international, as trade agreements erode traditional national boundaries and the entire planet becomes a single marketplace. How is this to be done? Now that the clamorous exaggerations for social media have begun to calm, we can see that merely having a robust online presence isn’t nearly enough. Social media is simply a tool: put a chisel in the hands of Michaelangelo and you end up with David. In the hands of a child, a chisel is merely something to thump and bang with, and possibly do damage. To really connect with the consumer, you have to think like the consumer. You have to have empathy. You have to get out of your box and into the mind and heart of the consumer you hope to reach. That may sound New Agey, but, as Mark Benioff explains in this interview about his late friend and mentor, Steve Jobs, Jobs’ spirituality (inspired by yogic meditation practices and The Beatles) made the Apple co-founder “a prophet” who knew what consumers wanted even before they themselves did. Steve Jobs not only gave them what they sought, which was a way to increase their connectedness to the world, he made them—and the world—a better place. I’ve spent a good part of the last three days in San Francisco on winetasting missions, a lot even for me, although I live just 3 subway stops away from Embarcadero Station and Ferry Plaza. I’ve been in Oakland now for 28 years: nearly ten years before that in San Francisco. So you’ll have to forgive me for making comparisons. When I lived in S.F., in the Eighties, Oakland was a Herb Caen joke. It was Brooklyn to Manhattan—and this was before Brooklyn’s current hipster revival: old, blue collar, conservative Brooklyn, New York’s version of the boring ‘burbs. The only thing Oakland had going for it was way better weather, which is why the Oakland Tribune used to publish its logo in orange: A reminder that, on any given summer day, while San Francisco was cold and foggy, Oakland was sunny and warm. Other than that, San Franciscans felt icky about Oakland. Crime, violence, racial politics. That’s how they viewed the city on the eastern side of the San Francisco-Oakland Bay Bridge. As for Oakland’s perception of San Francisco, it was a weird combination of “Who cares?” and envy. Oakland prided itself on being different: grittier, more real: the Raiders versus the effete Forty-Niners. But on Saturday night, everybody went to San Francisco because it was, well, San Francisco. There was a scene there that Oakland just didn’t have. Now here we are today. Oakland is enjoying its greatest renaissance in decades, on every level: culinary, cultural, artistic, tech, home value, income, diversity. We Oaklanders are enormously proud of this: it’s a great leap forward following our low point, the post-1989 Loma Prieta Earthquake, from which downtown never recovered. But I still don’t think San Franciscans give a thought about Oakland. They may have heard about some “boom” thing happening here, but whatever it is, it pales alongside what they see and experience every day throughout San Francisco. The building development! The incomes! The stores! The excitement! The sense of being someplace Important at an Important Time. And the beauty of the people, so young, healthy and in-shape. Oh, all that disposable income! Call them what you will: yuppies, techies, hipsters—they know they live in frigging San Francisco, the most magical and romantic of American cities. They know they’re only young once: If San Francisco had an official slogan, it would be Carpe Diem. Many of them won’t know what that means, of course, so let me translate: How lucky we are! But I celebrate these differences. It would be easy for the Bay Area to homogenize into one bland soup, but each part of it—of us—maintains its identity throughout our periodic crises: earthquakes, economic shakeups, demographic revolutions, wildfires, crime sprees. Neighborhoods change color, ethnicity and culture with alacrity, yet somehow maintain their fundamental identities. I guess you could call this our terroir: the terroir of Noe Valley or Adams Point, of the Sunset or Kensington, of Crockett or Cupertino. As for alcoholic beverages, well, both sides of the Bay like their quotient of booze. The currant rage right now is, of course, the mixed drink. Beer is huge; wine, perhaps less so—at least it doesn’t feel like it has that frisson of excitement compared to its sister boozes. Oaklanders probably drink more beer per capita because we’re poorer and more working class, but that doesn’t mean we drink bad beer. The local micro-breweries do good business here. San Francisco is no doubt way ahead of us in wine, both per capita consumption and price. Oaklanders still hesitate to drop much on a bottle: They’re not into the snob thing. They want something good, with a good story; but they’re not slaves to somebody else’s score or review.